Anyway, this is this month's kit....isn't it just scrumptious??? 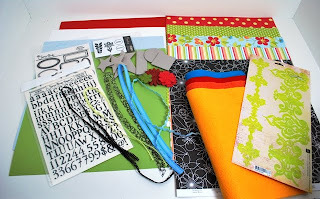 Look at all this gorgeousness...and even felt and stamps to play with!!!!! Loved every bit of this kit. 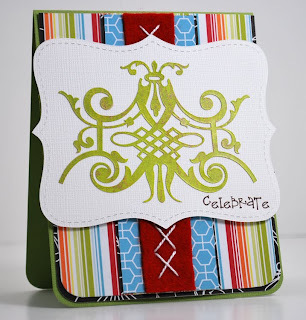 I love bright colors and these sure are bright and happy, and here are the cards I made using this kit. I hope you like what you see and if you are interested in the kit, you better run and order it, I think it will sell out quickly! And it's only $17.95. This month the kit will also include a stitching guide and the birdie template to make the little felt bird I designed. Anyway, head on over to Treasured Srapbooking and get yourself a pretty kit! Ohhh and before I forget, there is a huge sale going on in the store....everything except a few items are 50-75% off!!!!!! Can you believe that????? You better run!!! 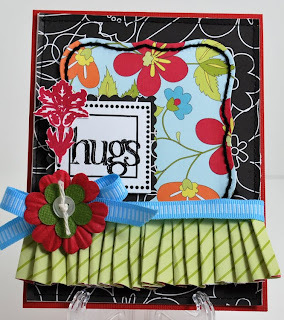 Thursday I will be back with a totally fun Blog Hop. 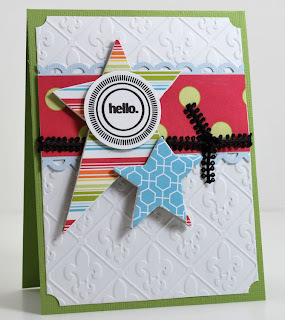 I was honored to participate in the JustRite Stamps Font Blog Hop, so stop on by. It will be a two day blog hop with the most amazingly talented 54 card makers involved.....and I am still tickled pink that I am included!!! Well, hope you have a fabulous day...Oh one more thing, these cards will be added to my Store along with a bunch of other cards that I haven't had a chance to add yet...so make sure you visit it if you are looking to buy some handmade cards.